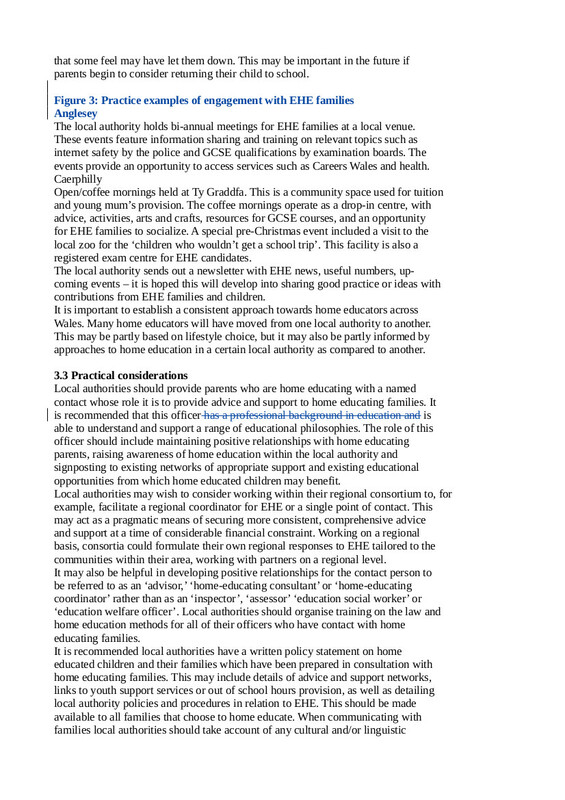 This is the fourth of a series of blog posts commenting on tracked changes to the draft Elective Home Education Guidance for Wales. The public consultation closes on July 3rd. ‘Professional background in education’ may be neither necessary nor sufficient if the role is reframed with more emphasis on challenging schools and improving access to services and support, and less on annual monitoring visits. This fits with the direction of travel elsewhere in Wales in amalgamating council functions and proposals to cut the number of councils. However, there are no suggestions as to how the single point of contact would be selected, and no discussion of how it would work for officers losing their current responsibilities. The post of EHE co-ordinator may be much less than full-time; for example, in Bridgend – which has been acknowledged as a model of good practice – the role is 0.2 Full Time Equivalent which pays for just 6 hours a week. It would be interesting to find out whether this was raised in the discussions with local authority EHE co-ordinators mentioned in the Equalities Impact Assessment. In England the prime example of amalgamation is the Triborough with Westminster, Hammersmith, and Kensington, where the most interventionist stance has prevailed. In Chapter 4 Reviewing provision the contact is seen as all one way; with families passively receiving notification of their annual check-up.